Sky blue is the lightest of the blues followed by Swiss blue and then London Blue. 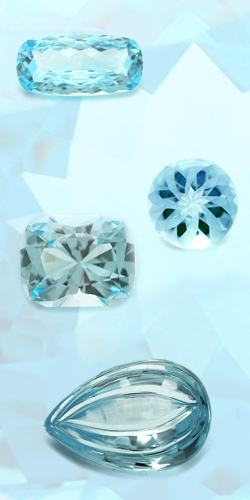 Blue topaz can resemble aquamarine, blue zircon or apatite. Sky blue most closely resembles aquamarine but is typically less expensive and it doesn’t display the pleochroism of an aquamarine (depending on the viewing angle, aquamarine will display blue to greenish blue or even bluish green color). Swiss blue is often described as a vivid electric blue and London blue is the darkest of the blues and is a rich blue gray color. Blue, once the most rare color of topaz, is today the most common, thanks to a stable enhancement process that turns colorless topaz blue. After the raw topaz is extracted from the earth and cut, it is irradiated to brown and then heated to sky blue. This enhancement process is permanent.